You are in Australia at the moment on an eligible student visa and you would like to get Permanent Residence here, now that you have gained an Australian qualification as a result of 2 years of study here. You also have an English language score of at least IELTS 6 in all four components. If you meet all of these conditions, let's explore which Visa you can apply for. Have you finished your studies and gained a qualification that gives you an occupation that is included on the current SOL (SOL 2012-Schedule 1)or that is subject to transitional arrangements? If the answer is YES, this will be your "nominated occupation". Download the SOL 2012-Schedule 1 to verify that the occupation for which you have an Australian qualification is listed, and find out which Agency you need to contact for the Skills Assessment related to your nominated occupation. If your nominated occupation is assessed by TRA, you need to do the "Job Readiness Program" and the only visa you can apply for is the Subclass 485 Skilled Graduate Visa. You don't need to do the Points Test at this time, because the only visa you are eligible for is the Subclass 485 visa. If your nominated occupation is assessed by VETASSESS, you also need to apply for a Subclass 485 Skilled Graduate Visa and gain at least 12 months of paid work experience in Australia. 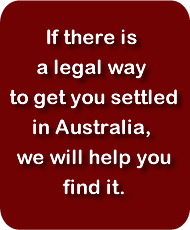 You may be eligible to apply for a Subclass 189, 190 oe 489 visa after that. If your nominated occupation is assessed by any other Agency than VETASSESS or TRA, you need to do the Points Test. If you score 65 points or higher, it is likely that you are eligible for a Skilled Independent Visa Subclass 885, but you need to verify that you meet all the requirements for this visa. If you score less than 65 points and you have an eligible relative in Australia who is willing to sponsor you, you may be eligible for Skilled Regional Sponsored Visa Subclass 487, provided that you meet all the requirements for this visa. If you score less than 65 points, you could apply for sponsorship by a State or Territory, which if successful will give you an extra 5 or 10 points on the Points Test and could make you eligible for a Skilled Sponsored Visa Subclass 886, provided that you meet all the other requirements for this visa. If none of these options are appropriate for you, you will probably need to apply for a Skilled Graduate Visa Subclass 485, which enables you to stay in Australia for a further 18 months and gives you time to improve your circumstances such that you may meet the requirements for a Permanent Visa. In fact, you can apply for a permanent visa at any time during the 18 months as soon as you are ready, whether it be through a Subclass 189, 190 0r 489 visa, or through Employer Sponsorship. If there is something in your current situation that you would like to have clarified, or if you would like independent confirmation that, having finished your studies in Australia, you are eligible to apply for a Visa, call us on 8410 6262 to make an appointment if you are in Adelaide: we have a discounted consultation fee for international students in Adelaide. If you are interstate, with a detailed explanation of your situation together with your CV or Resumé as an attachment. Within 3 days of confirmation of payment of our consulation fee we will send you detailed and thorough advice by email and make a follow-up phone call to talk things through with you soon after.